Over the past 2 months I have been enjoying immersing myself in my artistic practice amidst the glorious countryside environment that surrounds my studio, in a small corner of Hertfordshire. The work I have recently been developing started taking shape whilst undertaking the residency at Wicken Fen, that I worked on with Helen Terry back in April. We were both immensely pleased with the work we completed for this project and touched by the feedback we received but we also felt that there were areas of interest that could be taken further. Although we work in quite different ways and with different media we decided the best way to move these emerging ideas forward would be through a series of joint studio days. In August I spent a fabulously productive day in Helen’s studio experimenting with materials and process to take some of these ideas further. Helen’s palette in the studio - For the main part of the day we undertook some practical experimentation with media and imagery. We started the day chatting and writing masses of notes about our ideas, whilst sitting in Helen’s lovely summer house - Specifically we wanted to identify areas of interest that we felt had scope to be taken further. Also, to explore the ‘cross overs’ and our ways of working in order to add breadth and depth to our working practices. Monoprint drawing, drawing ink on Japanese paper. Armed with a mass of materials and tools it was fun ‘mixing it up’ and working out of our comfort zone. Monoprint drawing, ink and acrylic paint produced in Helen’s studio. Laid out on my studio floor at Whitwell and thinking about ways to frame. We came away from the day with some food for thought and both buzzing to spend some time in our studios seeing where some of these ideas could go. Photograms laid out on my studio floor at Whitwell and thinking about composition and how they could be framed up. Over the past month its been a case of working on several threads of thought both in my studio as well as the darkroom at Digswell Arts and also in the Print studio there. Although at the moment I am not sure where some of the work is going, the journey is proving to be both challenging and rewarding. Digswell Print Studio August 2018. Working on some new plates. Work in progress, Digswell Print Studio, August 2018. Solar etching and mono print on Japanese tissue. 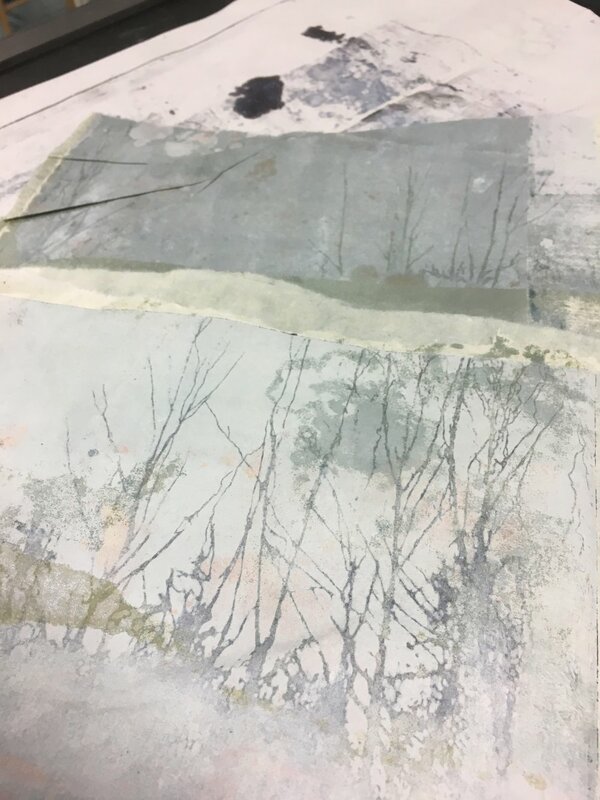 Work in progress, Digswell print studio, September 2018, solar etching and mono print on Japanese tissue. Helen and myself will soon be getting together again for a second collaborative practical day where we will be reviewing and reflecting on the work we have both been developing over the summer. In my next post I will be able to reveal more of our project and our plans for a future show of work. Also a sneak peek of the larger canvases I have been working on and some smaller experiments with Cyanotype printing.